At the start of my pregnancy, the one ingredient that I found repelling was garlic. Prior to the hormone invasion and the development of this new keen sense of smell, garlic and I had a pretty pleasant relationship. I wasn’t in love with it, but it also didn’t make me gag. However, after these last months of being pregnant, I thought garlic and I would need to go our separate ways. My husband wasn’t allowed to cook with it. Oh my, the smell of garlic frying in the pan would trigger nausea and unattractive barfing motions. In fact, I even asked him to watch what he ate for lunch when at work. As soon as he entered our apartment, I could tell if garlic was in his meal or not. I couldn’t bear it. I was worse than a vampire. Some of my girlfriends who passed the thresholds of pregnancy told me that many of the foods they had grown to dislike during that time, never reversed itself after wards. And so I wondered if that would happen with garlic. Was roasted garlic going to be out of my life forever? This all important ingredient that often appears in recipes to boost flavor? Would I be able to find a substitute? Well, those hormones have calmed down and instead of being turned off by food, lately I am just tired and in need of sleep. I put myself to the test and tried to see if good ol’garlic and I still had a chance. Could this relationship be saved? Instead of omitting it from a recipe, with this one, I pushed myself to include it by first frying it in a pan. To my surprise, my olfactory nerve was able to tolerate it. That old familiar scent of garlic frying in oil didn’t cause a stir or send me away. Not only could I stand it, but after adding the rest of the recipe’s ingredients, I was able to sit down and enjoy eating it in my food again. Here’s a story with a happy ending: garlic and I are back together. Add the garlic and chili flakes. 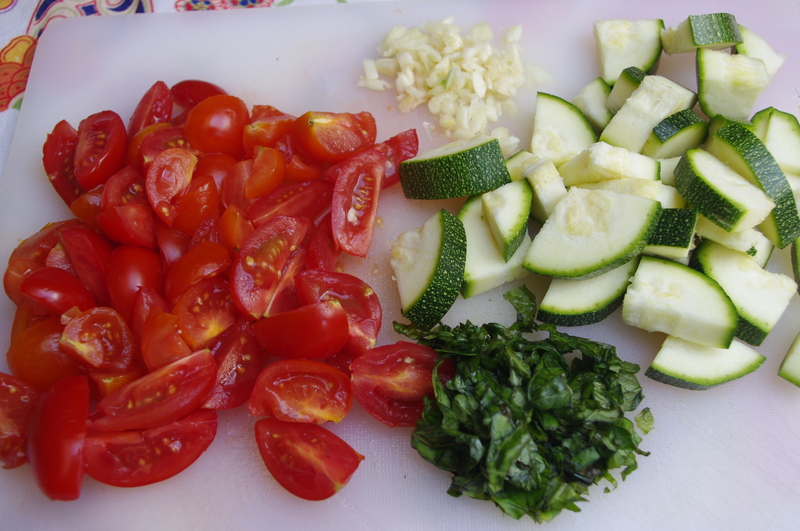 Then add the zucchini, tomatoes and dried oregano. Cook for about 5-7 minutes, or until vegetables are tender. 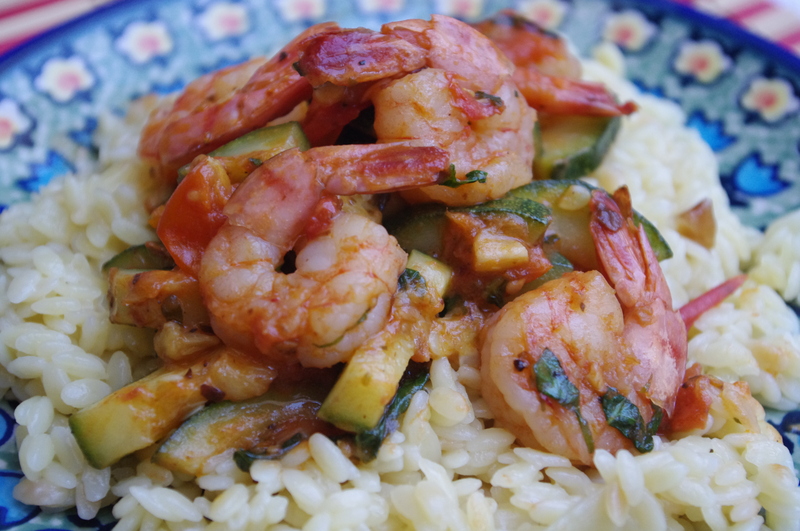 Then add the shrimp and basil. Heat oil and butter in frying pan. Add onion and cook until transparent. 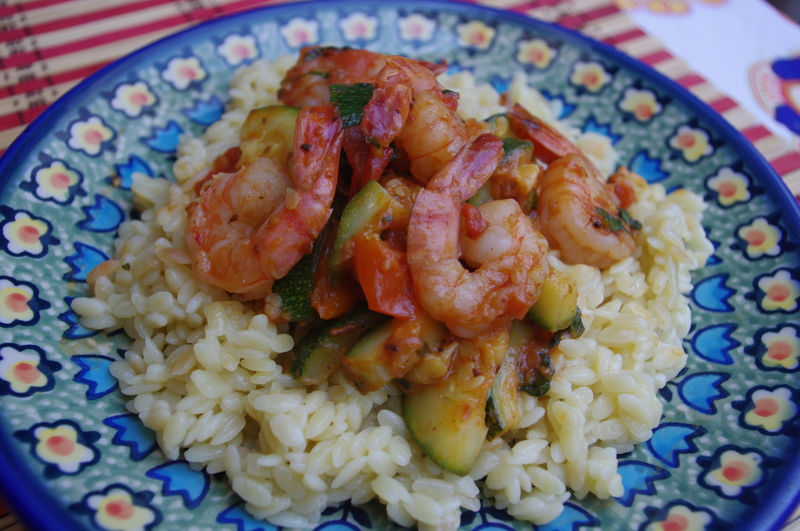 Add orzo, stir and be sure pasta is evenly coated with oil. Then add a cup of water to the pasta. continue to add another cup of water. Cook until al dente, about 15- 20 minutes. Of all my kitchen appliances, the one I am the least fond of is the blender. I love cooking, but I detest the clean up part. My issue with the blender is that is just isn’t an easy object to clean. Thankfully, it fits in my dishwasher, so I should work on developing a better relationship with it. It’s still warm in Prague, which I won’t complain about, especially after living through some of her winters. We did, recently, have some spectacular thunderstorms that helped cool down the temperatures. But the heat definitely decreases my appetite and enthusiasm for cooking. 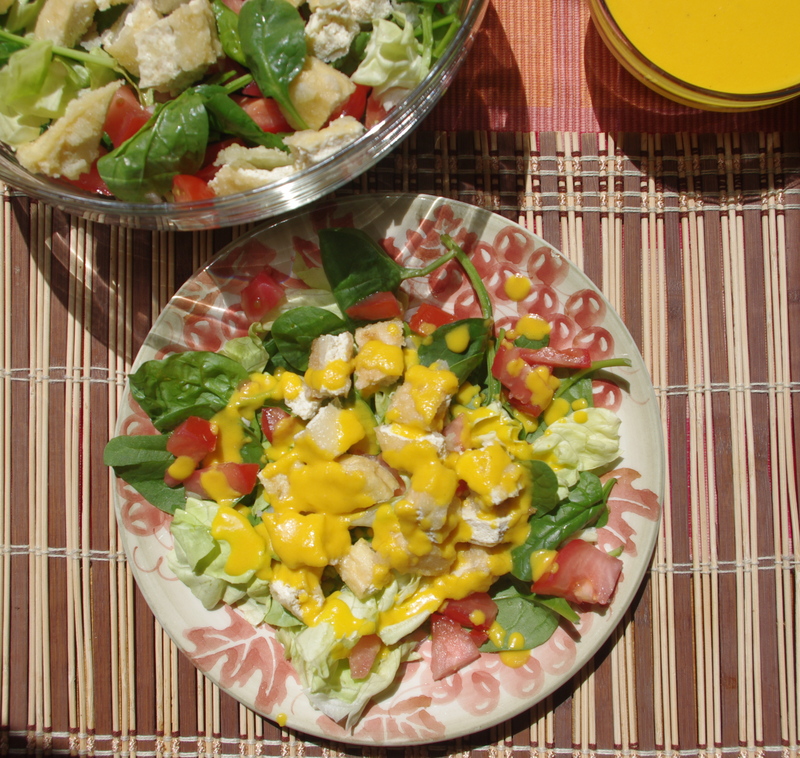 So, salads still continue to dominate the table. Normally, we dress our salads with just a simple combination of flavorful Spanish olive oil and salt, but today I want something a little more to go with my leafy greens. I miss going out for Japanese. When I lived in NYC, there were plenty of great meal deals and I was used to going out several times a month to a Japanese restaurant with friends or family. I often ordered a side salad served with carrot-ginger-miso dressing to accompany my meal. Love that stuff, miss those days! Since moving to Prague, I now considered it a special treat when my husband and I occasionally splurge for dinner at a Japanese restaurant. It’s incredibly pricier out here compared with what I grew up with. There are a few Asian grocery stores spread throughout Prague where I can buy ingredients to prepare a Japanese meal at home, but even that can burn a big hole in our wallet. Today’s salad is a combination of baby spinach leaves, lettuce, sliced tomatoes, scallions and dices of fried tofu with carrot-ginger miso dressing on top. 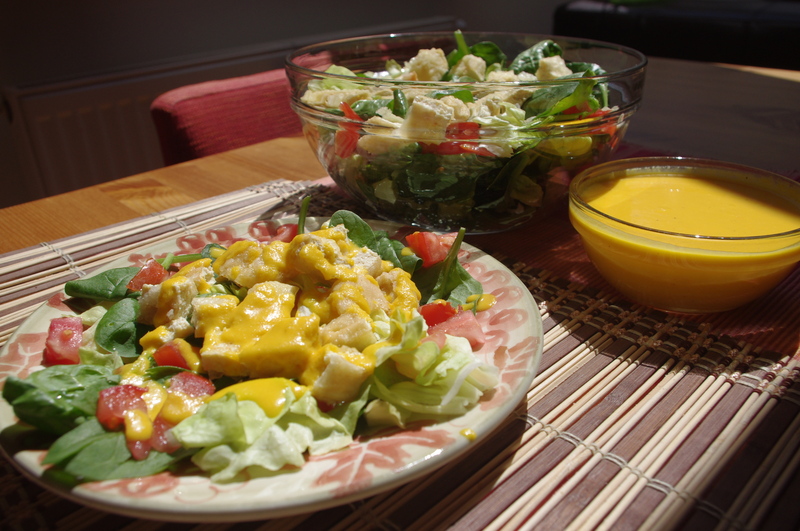 I made the dressing myself, hence the whining bit about the blender. I really should refrain from whining. That’s bad role modeling for my daughters. I should be thankful and embrace my blender with an open heart. 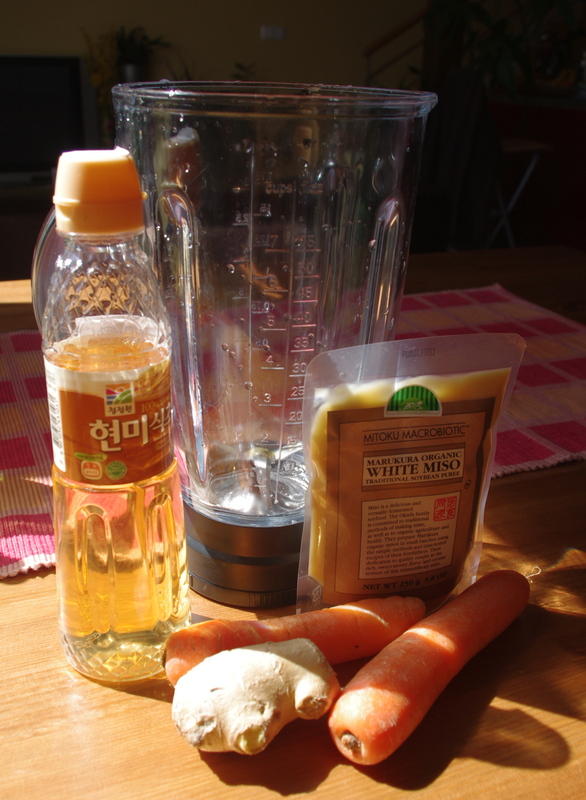 I’ll start now: Thank you blender for helping me make carrot-ginger miso dressing. Put all the ingredients in your beloved blender, except the water. until you get the right consistency. Drain and slice tofu into thin blocks. Cover all sides in cornstarch and salt mixture. Heat oil in shallow frying pan. When ready, add the coated pieces of tofu. until it begins to turn golden. Toss all the vegetables in a bowl. 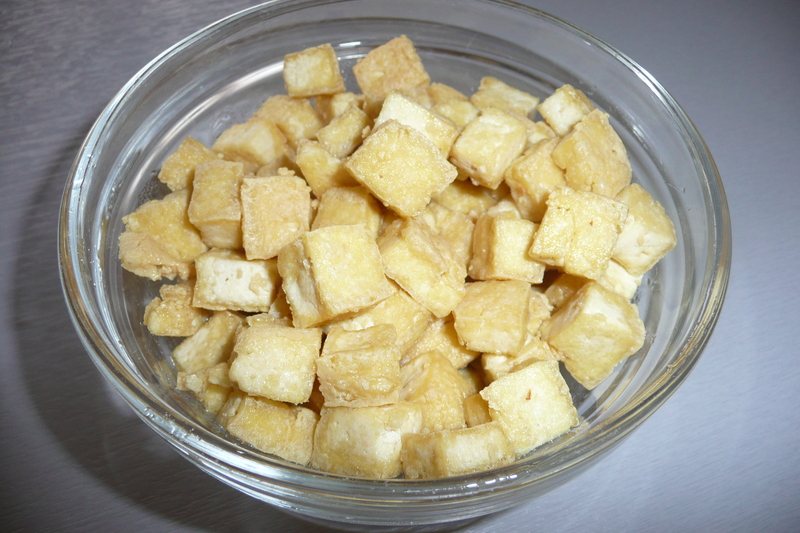 Cut up the tofu into small square pieces. 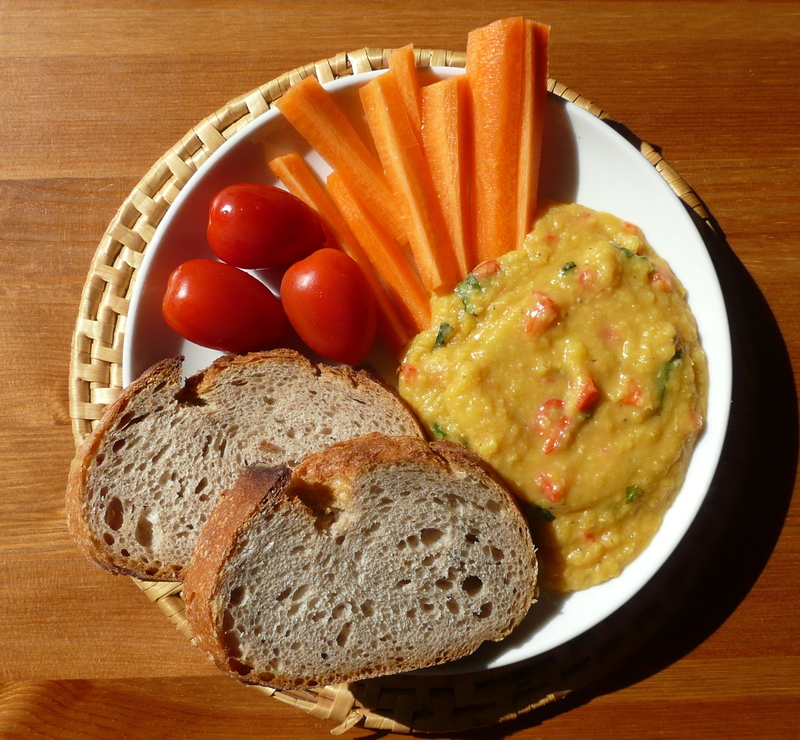 Serve with carrot-ginger miso dressing. 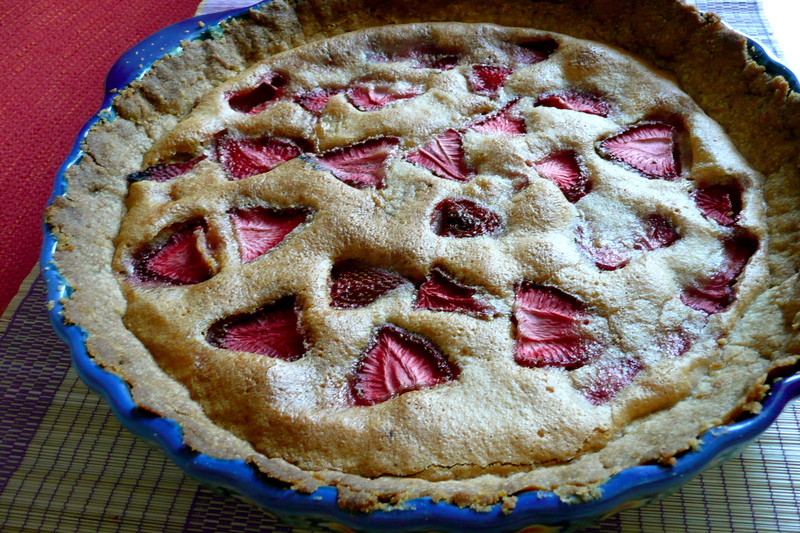 … a strawberry custard like tart. Why? Because when I left my house this morning to meet a friend and turned the corner, I walked into a farmer’s market that popped out of nowhere! Surprises like this, usually result with some spontaneous unintended purchase. 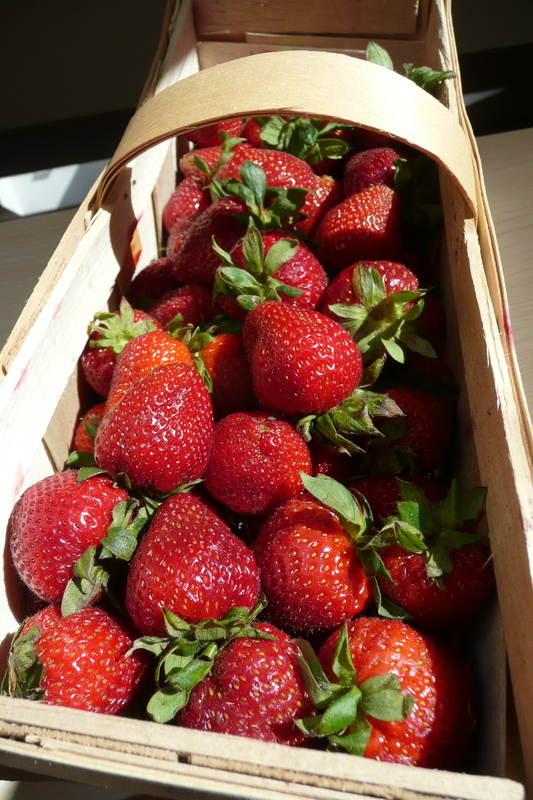 On this particular day, it was a basket of luscious red strawberries. I guess I am a sucker for good packaging. I left home with a plan to stop at the supermarket on my return home. Strawberries, however, was not on my shopping list. Raspberries were. But alas, there was not a raspberry stand at the farmer’s market and this basket of crimson berries was calling my name. 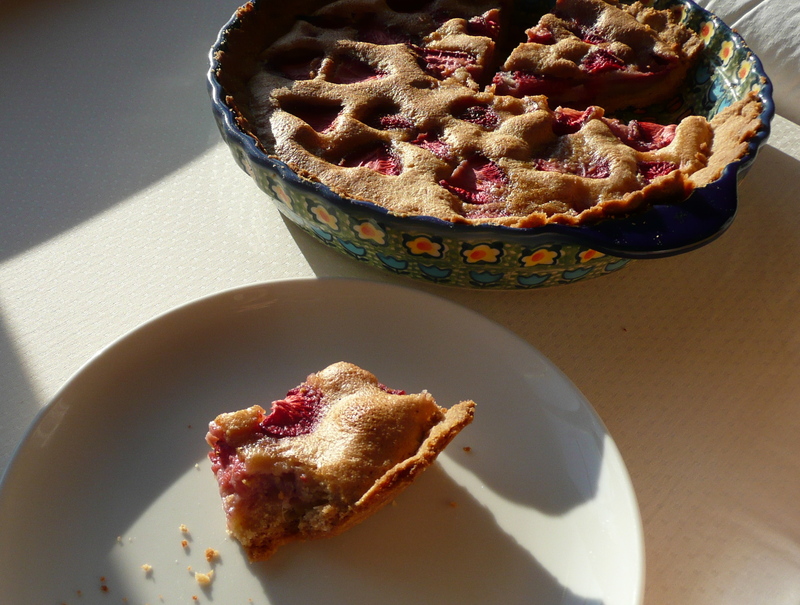 I knew I could just adapt the Brown Butter Raspberry Tart I was reading about in Bon Appetit the night before. Strawberries, blueberries, raspberries, I love my berries. When I see them packed in their baskets, I know that summer is near. And when summer is here, my second favorite dessert after a cup of ice cream is anything made with fruit. With such a huge number of strawberries on hand, this might just be a 1 in 3 part series about strawberries. Preheat oven to 375/190 degrees and place the rack in center of oven. 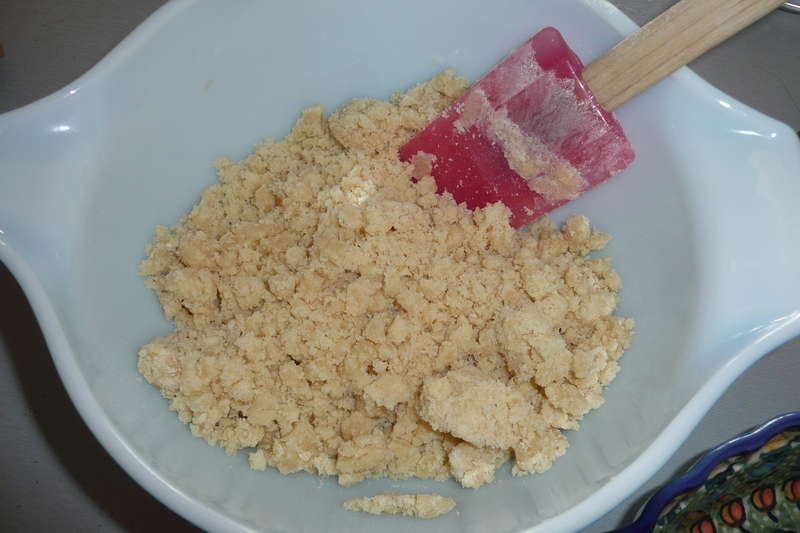 Toss a pinch of salt into your flour and add it to the butter mixture. It will look like breadcrumbs. Using your fingertips, begin to press the dough evenly around the sides of the pan. pressing it down evenly and smoothly from the sides. Bake crust for 18 minutes, then set aside to cool. Whisk the sugar, eggs, and salt in a medium bowl. Add the flour and vanilla. Put the diced butter in a heavy sauce pan. Cook over medium heat, until the butter has a copper tone to it. Be careful not to burn it! 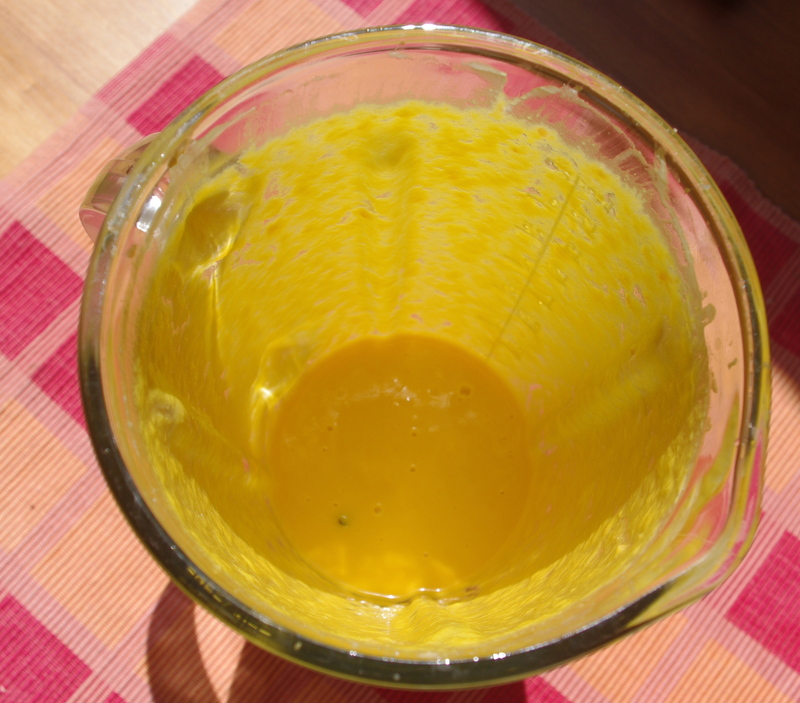 Transfer the butter to a heat-resistant glass, best if it is a measuring cup to be sure you melted half a cup. Gradually pour the browned butter to the other mixture and whisk until well-blended. 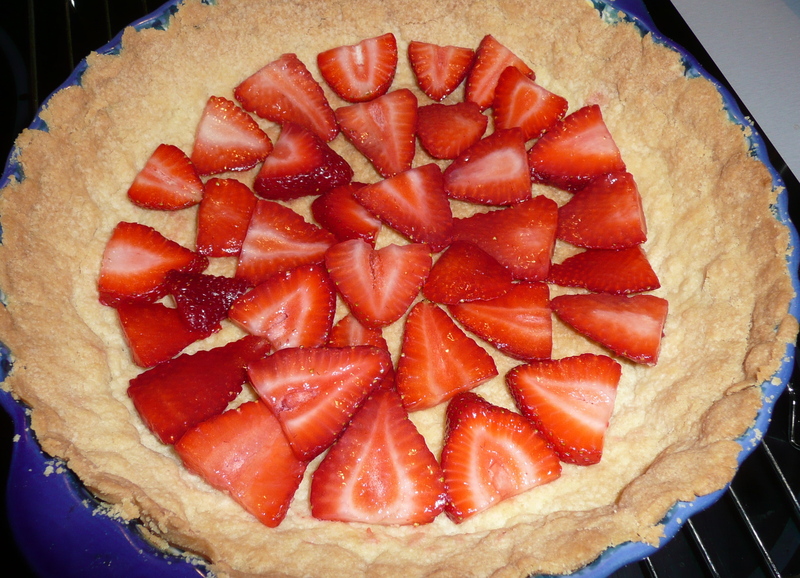 Place 1 cup of sliced strawberries in a circle around the cooled crust. Pour the browned butter mixture over the berries. 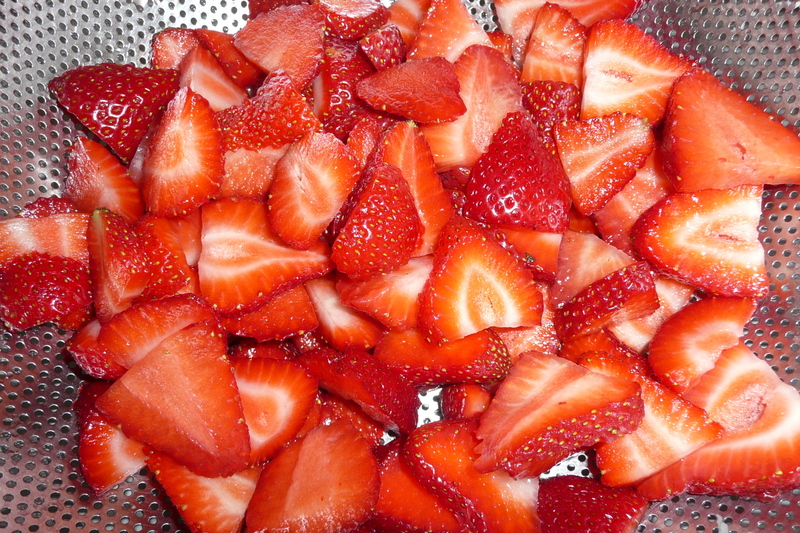 Add the remaining strawberries to the top of the mixture. Bake for 40 minutes or until the center comes out clean. Enjoy and think of the sunny summer days ahead! Lentils were an absent staple in my childhood and it wasn’t until late into my adult years that I did come to appreciate them. Today, I am a happy convert and no longer shy away from these mini discs of protein. 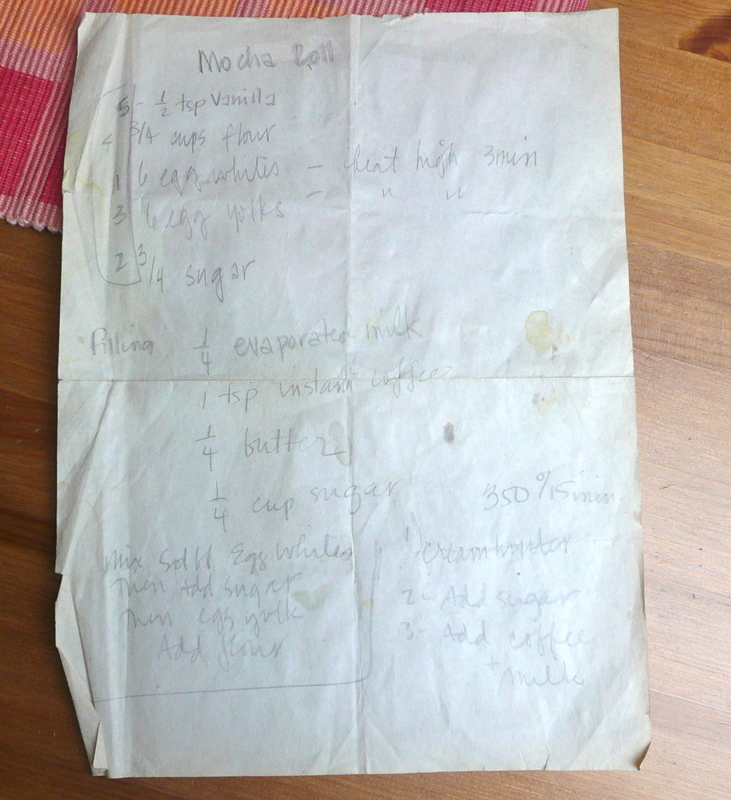 I dug this recipe out of my notebook of loose clippings and handwritten recipes from friends and family. 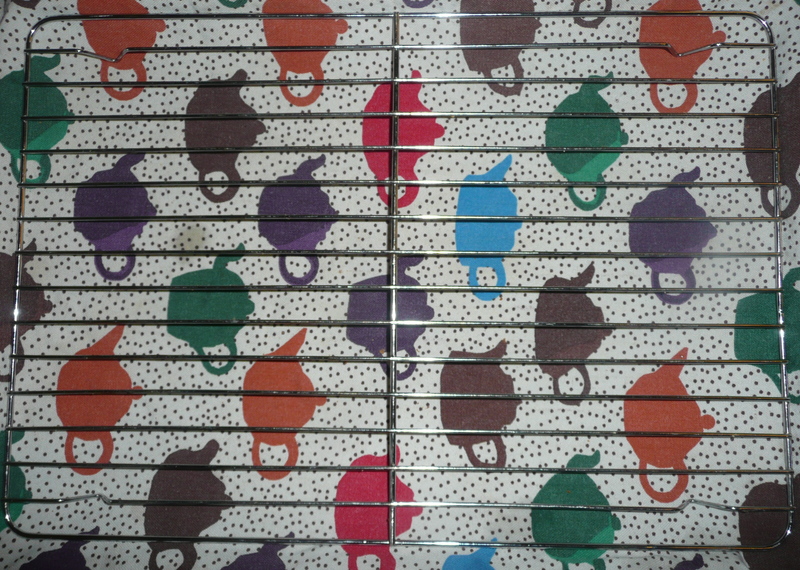 This one is from an American friend named Courtney, originally from Portland, Oregon. Our paths happened to cross in Prague. Some of the exciting parts about living abroad are the interesting people you meet from all corners of the world and sharing the experience of living in an unfamiliar land where you must learn and adapt to a new set of customs and rules. The most difficult aspects of these ex-pat friendships is never knowing when those friends might move, dealing with the pain of having to say good-bye and then mustering the effort to start all over again and find a new set of friends. The bittersweet cycle repeats itself: make new friends, but somehow manage to keep the old. I notice that the development of these overseas friendships are more intense in comparison to the ones that were steadily nurtured in the stable streets of my childhood. Moving to a new city and then meeting others in the same situation, one instantly forms a bond with others who share the experiences of these major life adjustments. Those experiences quickly help shape your relationships and there are so many ups and downs that come with acclimatizing to a new culture that you bare all your insecurities with the circle of people who suddenly become your support group away from home. 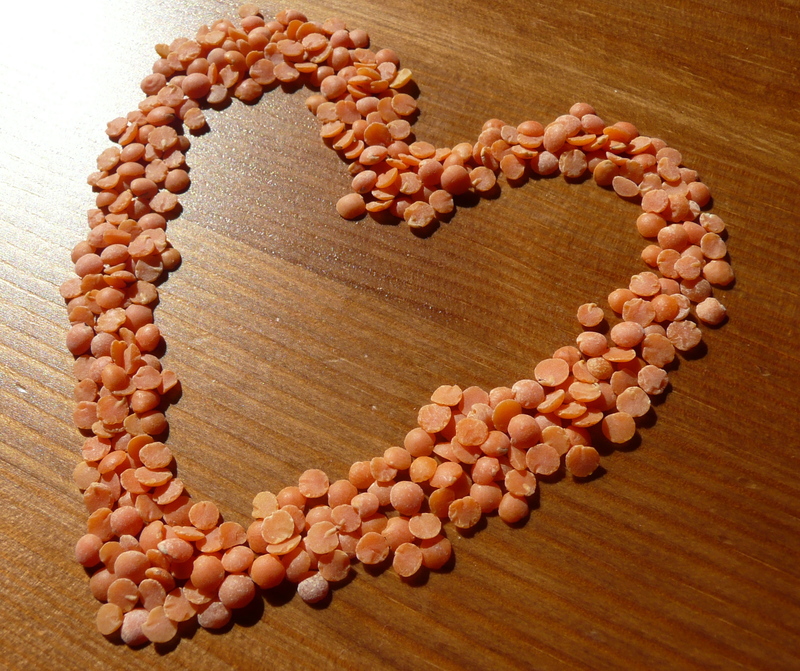 Put lentils, garlic, and 2 cups of water in a saucepan. When the water start to boil, reduce the heat. When done, set aside to cool. Using a hand blender, purée the lentils. Add the red pepper, chilis and finely chopped basil. Then stir in the lemon juice, honey, oil and salt to taste. 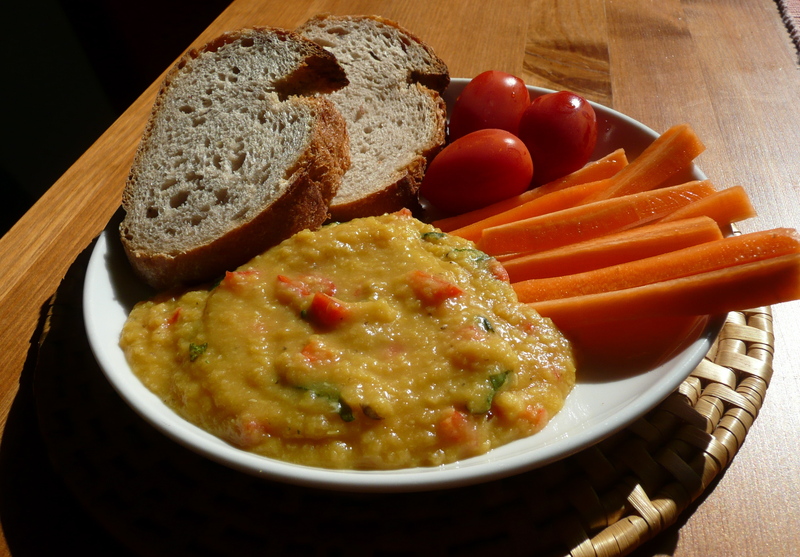 Serve with fine bread, sliced carrots, cucumbers or tomatoes on the side. In the film “Somewhere,” director Sophia Coppola’s latest work, there is a scene in which the 11-year old daughter of the movie’s protagonist is making macaroni and cheese from scratch. Her father is a Hollywood actor who resides in a hotel suite in LA. Just before we see her cooking, she is on the phone with the hotel receptionist, ordering in the ingredients. I was dazzled by the depiction of this girl’s sophisticated talents in the kitchen. When I was her age, my only encounter with macaroni and cheese came from the blue Kraft Macaroni and Cheese box. Granted, my parents are Filipino and although we were living in the States, this was not a popular dish in our household. I only learned about it from visits to some of my classmates’ homes. When my family and I went grocery shopping, I would beg them to add a few boxes to our cart. My parents thought it was the unhealthiest meal I could ask for, especially since it came straight out of a box. However, they gave in and I remember how much fun I had following the simple directions and the feelings of independence it gave me. I’ve come a long way from cooking out of that navy blue carton. 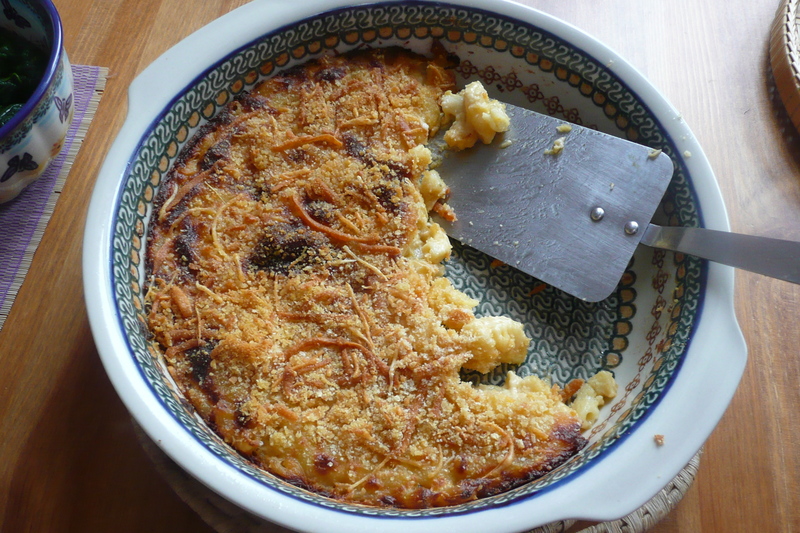 Fortunately, I have also eaten better versions of this rich cheesy pasta in some of NYC’s delicious soul food restaurants and enjoyed it even more in the southern parts of the US. The scene from the movie sparked a craving for mac n’ cheese, so before we swap the heavy casserole dishes of winter and trade them in for the lighter meals of spring and summer, I’ll take this last opportunity to indulge my waistline. Wait? What am I talking about here? I’m pregnant and I need the calories! 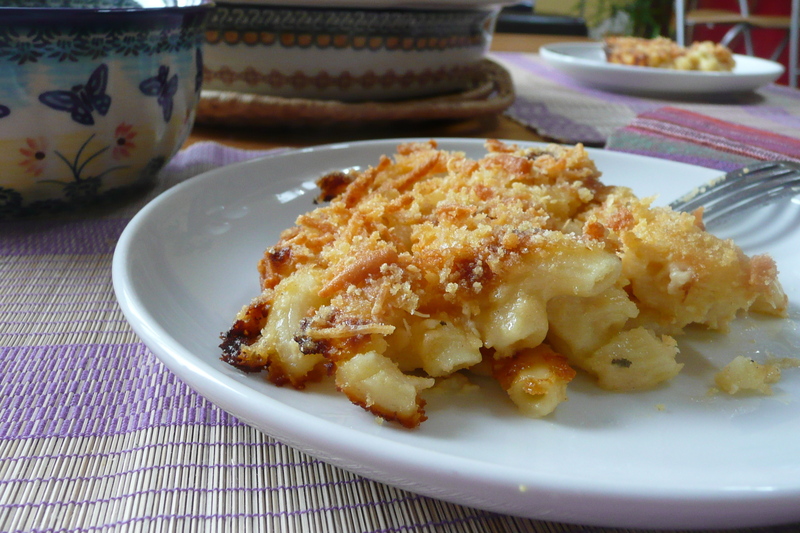 Here’s to grown up macaroni and cheese! All dressed and ready to get baked! Preheat oven to 350/180 degrees. Lightly grease a ovenproof baking dish. After draining it, set it aside in the baking dish. Melt butter in a saucepan and add the sage. Then quickly whisk in the flour. Cook until mixture thickens, about 2 minutes. Then add the milk, constantly whisking, again until the sauce thickens. This may take 6-7 minutes. 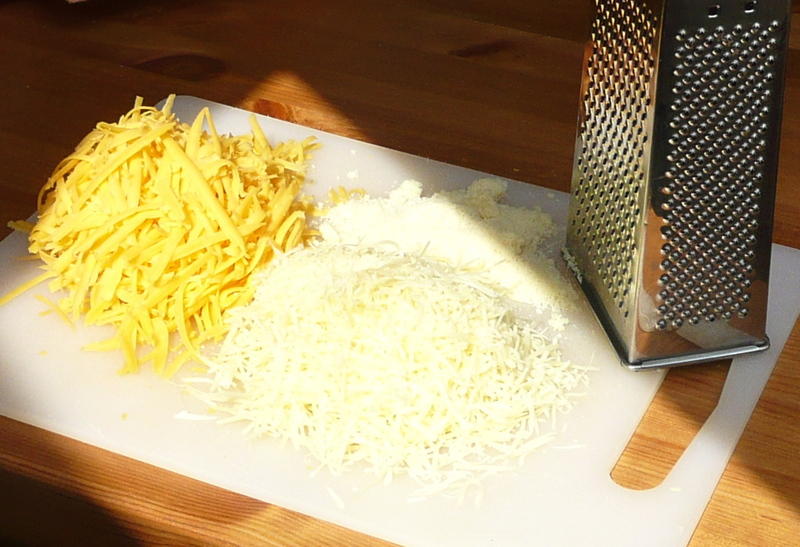 Put the breadcrumbs in a bowl and add a tablespoon of each cheese in the bowl. Add the remaining cheese to the sauce and stir until smooth. Reheat over very low heat to melt completely. 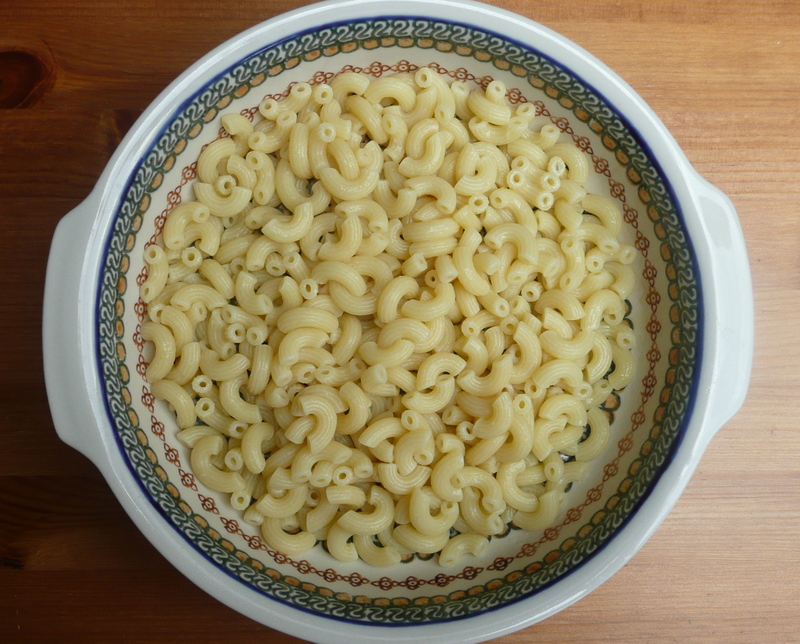 Pour sauce over the macaroni and gently combine sauce and pasta. 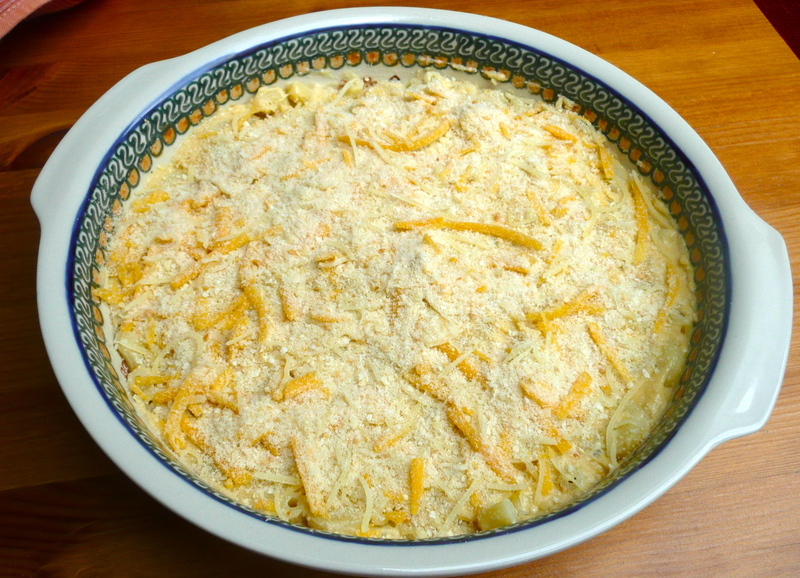 Sprinkle the bread crumbs and cheese mixture on top. Serve with a side of spinach to lessen the guilt. I’m celebrating. I’m celebrating that I am half-way there. I am celebrating that I am in week 20 of my pregnancy and things are going very well. I am celebrating that the doctor just said that we’ll be the parents of two little girls. 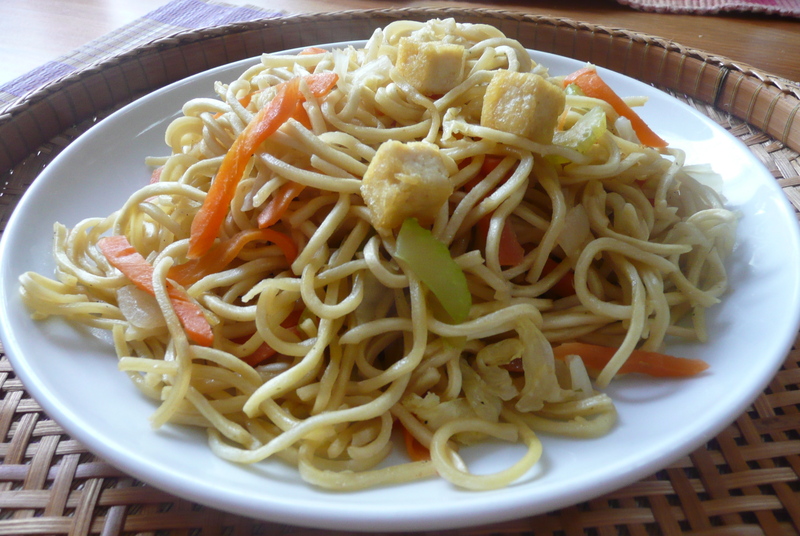 And I am going to celebrate the best Filipino way I know how, with a plate of Pancit Canton (Pahn-seet Cahn-ton.) These 16-ounce packets of wheat noodles have yet to appear on the shelves of Prague’s grocery stores, therefore I usually reserve them for special occasions, such as birthdays or Christmas dinner. (Back in NYC, a package costs about $1.99 and I have been known to buy some to take back, and have asked family members to stuff a few bags into their suitcases when coming to visit) But, these are special times and that means the pancit must come out. 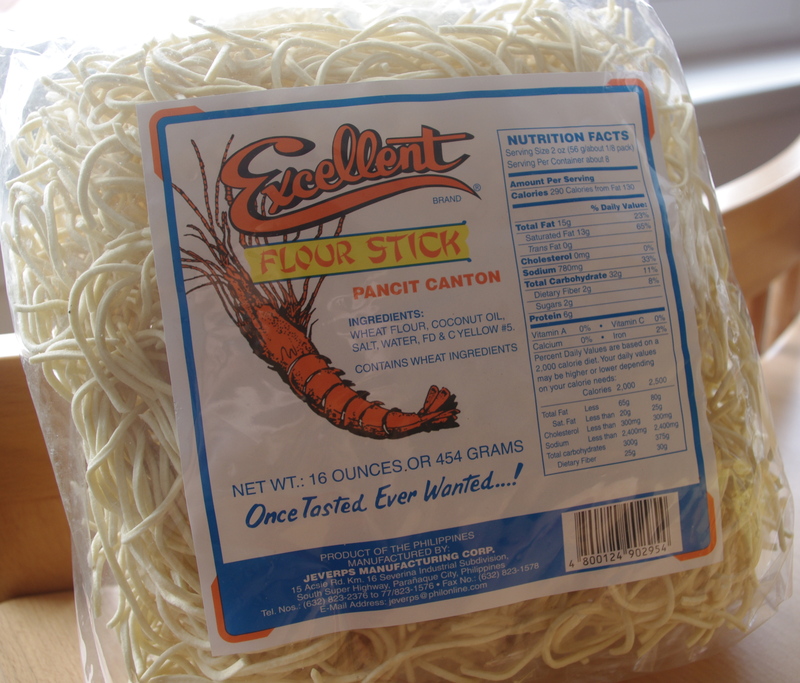 I miss Asian grocery stores! 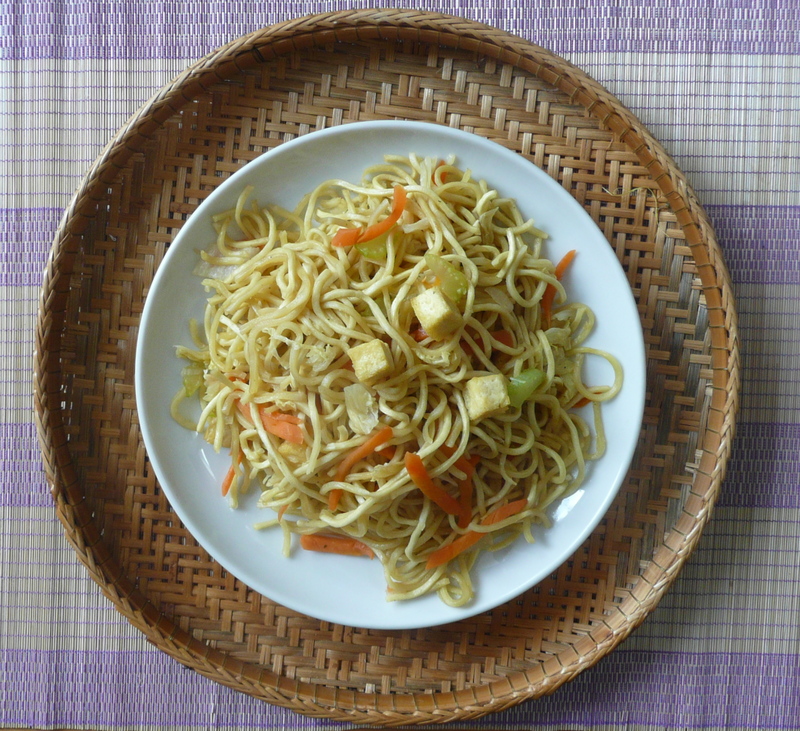 Pans of pancit regularly appear on the tables of a Filipino celebration: birthday, christening, Christmas or Easter. Those long, thin strands mixed with vegetables, meat, shrimp or tofu sits waiting to be devoured by the multitude of guests. 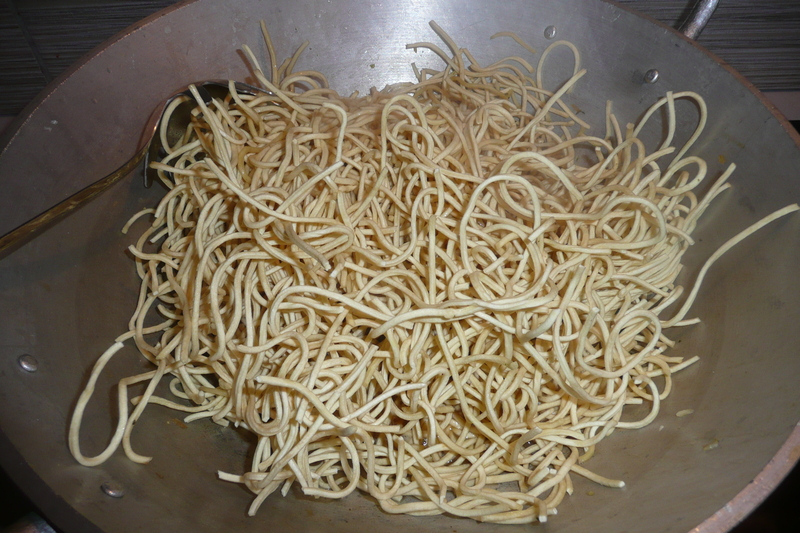 Growing up, my family had me believe that if I ate a plate of these sautéed noodles every year on my birthday, I would live a long and prosperous life. My grandmother just turned 89 in March and still exhibits the same sharp wit I have known since childhood. Obviously, Grandma ate her share of pancit too. It’s impossible for me to take this family superstition lightly. When I introduced this dish to my husband’s side of the family, my Spanish father in-law thought it was a very complete meal. You have your carbohydrates, protein and vegetables all in one. Lately, some friends who recently became parents have been sharing stories about the kinds of foods that appeal most to their children. Many of the flavors that the mothers had exposed their little ones to while in utero, are ones that the babies favor and seek out. 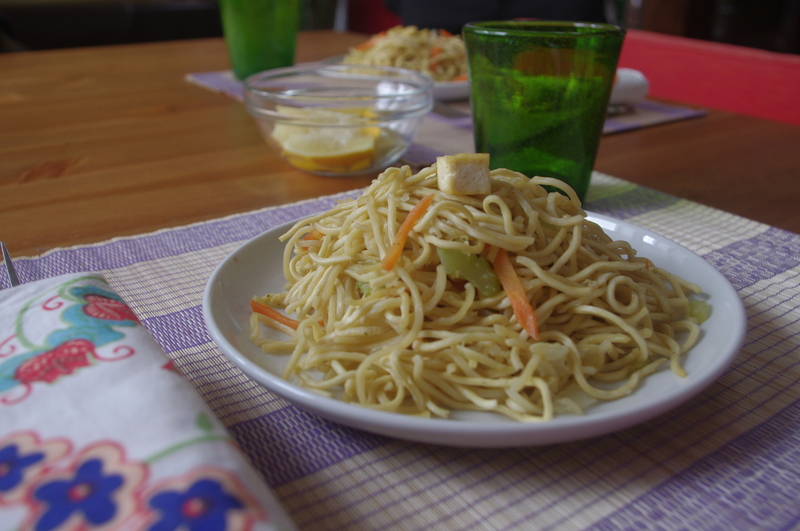 I think it is time to introduce my twin girls to the taste of pancit and get them ready for this birthday tradition. Heat a large, deep non-stick pan and place two tablespoons of oil. When ready, add the tofu. Fry until crispy and pale yellow. Scoop out with a slotted spoon and set aside. Add the remaining tablespoon of oil and the garlic. When it turns slightly golden, add the onions. 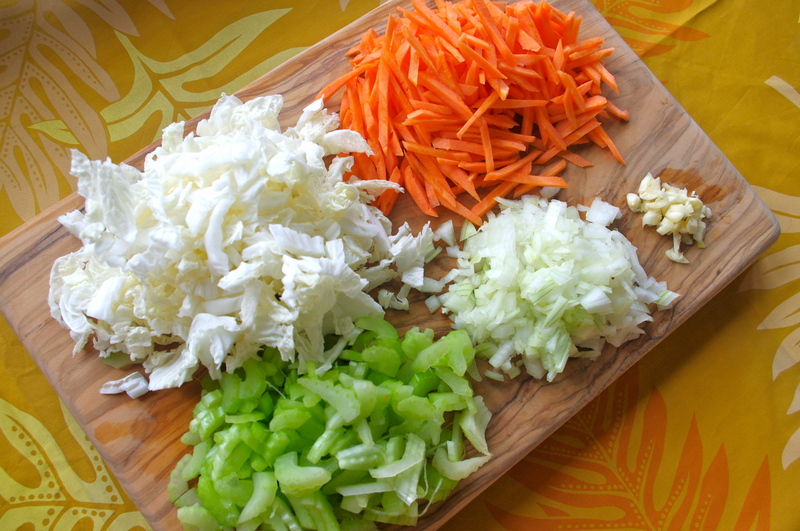 When the onions become transparent, add the carrots and celery. Cook for about 5 minutes before adding the cabbage. 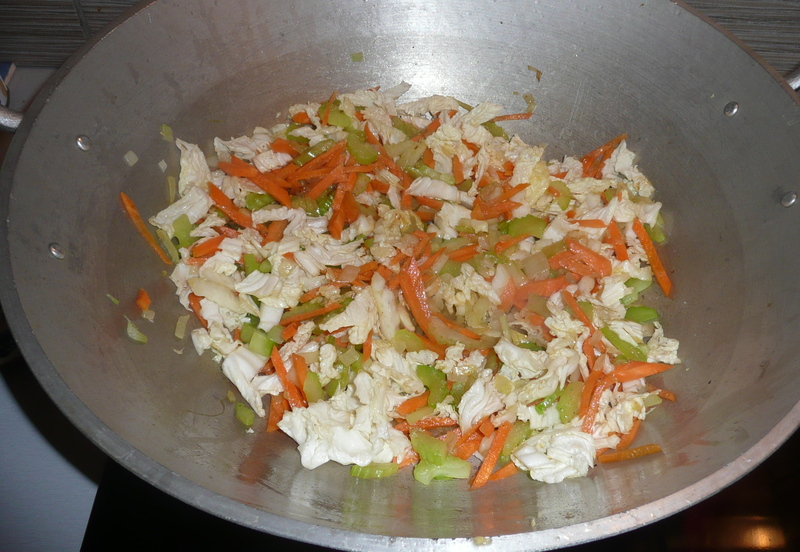 After adding the cabbage, also add 1 tablespoon of soy sauce, salt and pepper and stir fry. The vegetables should maintain a crisp tenderness to them. It should probably take another 3-4 minutes to cook. When done, remove and set aside. In the same pan, add the broth, remaining tablespoon of soy sauce and a little bit of salt. When the liquid comes to a boil, gently add the noodles. Evenly mix the noodles with the sauce and allow the liquid to get absorbed. After a few minutes, add the vegetables and tofu. 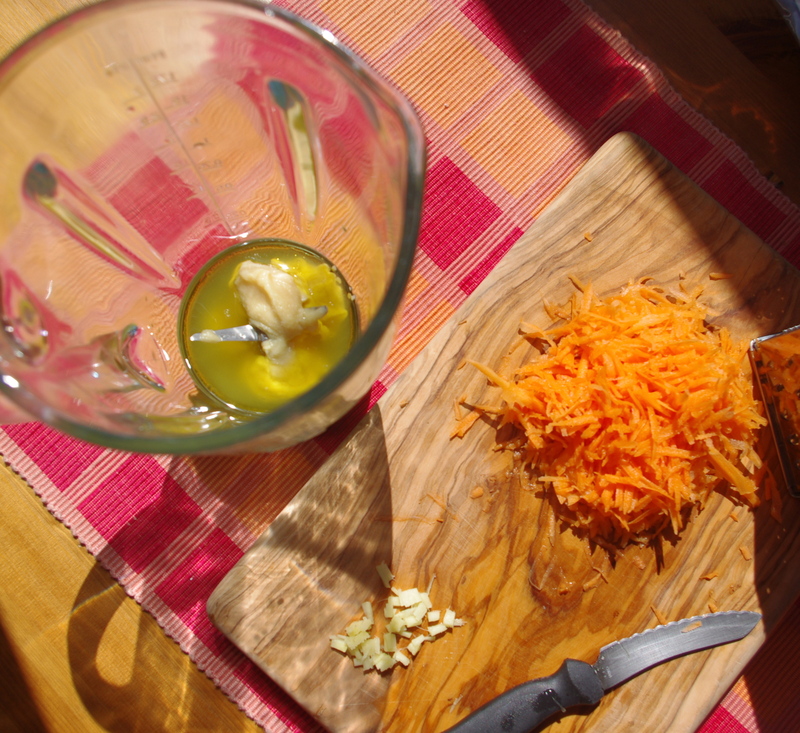 Continue to carefully mix the ingredients all together. Serve warm with lemon wedges on the side. My dad has four sisters. When I was 5, one of them came to live with us. She came straight from The Philippines and moved into our tiny NYC apartment. Her name is Eloisa, however, in our family and with other Filipino friends, we never called people by their officially documented names. Everyone in our Filipino-American world had a nickname and it would be a long time until you found out a person’s “real” name. My aunt was the second to the youngest in her family, but for some reason they called her “Baby,” just like in the movie Dirty Dancing. Out of respect for our elders, we always addressed our aunts by first using the word Tita which is aunt in Filipino and then by their nickname. Somehow, my brothers and I started calling Tita Baby, “Tita Babe” and eventually she became “Tita Babes”.For the three of us, Tita Babes was like a third parent. She moved to the States to be closer to her family and to help my parents out. Much of the immediate family had emigrated earlier to Toronto, Canada or NY. She was the last to relocate. The year she came to live with us, was also the year my mother started a full time job. 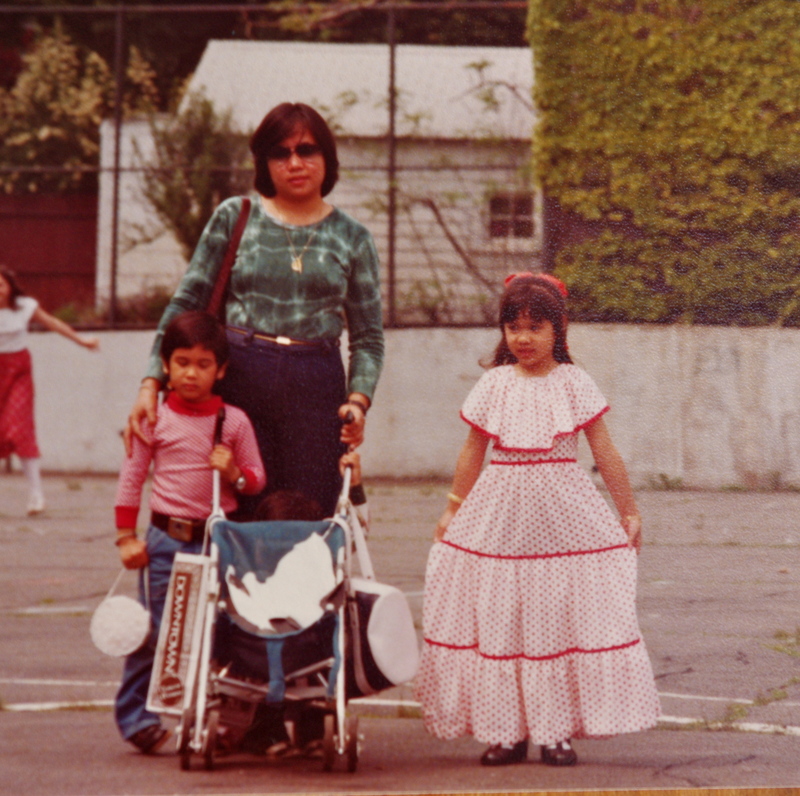 Tita Babes became our own Mrs. Garrett (see TV show Facts of Life , if you don’t know Mrs. G.) She brought us to and from school, took us to the library, spent hours with us at the park, walked us to the local Baskin Robbins Ice Cream Shop and cooked a lot of tasty meals for us. Tita Babes is one of our family’s finest in the kitchen. When we got to our teens, Tita Babes left and moved into another apartment with two other sisters. We are still very close to her and she holds a very special place in our hearts. Over the years, I have collected many recipes from my special Tita. 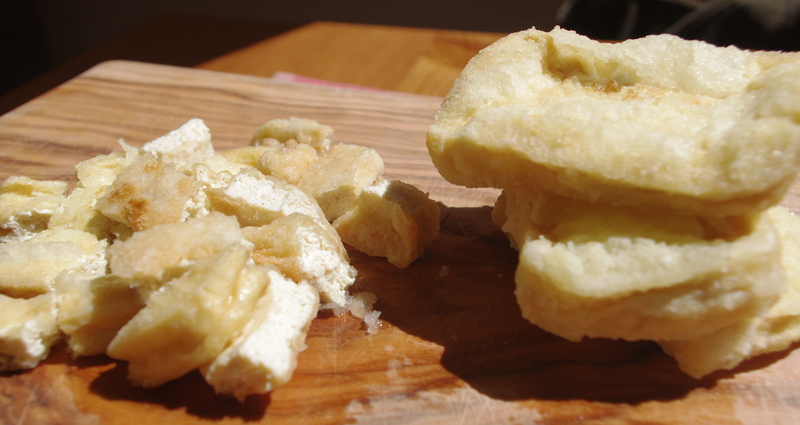 Just a few years ago, she started experimenting with baking and last summer I got this recipe from her. We typically celebrate birthdays in our family with an ice cream cake or a mocha cake from our local Filipino bakery. 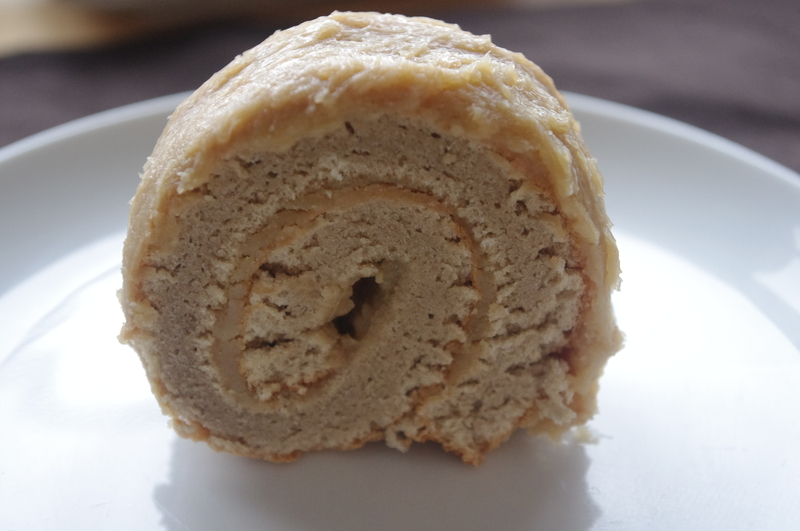 I was surprised to find a recipe for mocha roll stuck to her refrigerator door. 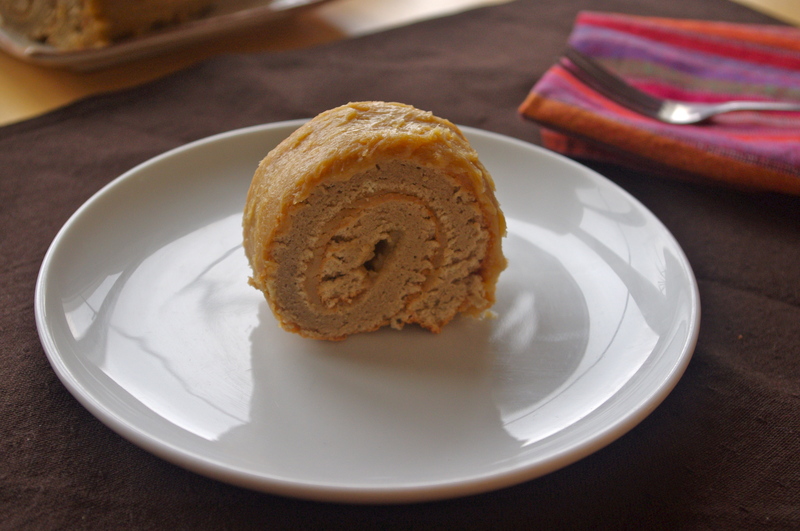 The combination of a mocha sponge cake and mocha buttercream frosting often graced the tables of many Filipino celebrations and was served in different ways, such as a roll, sheet cake or layered cake. 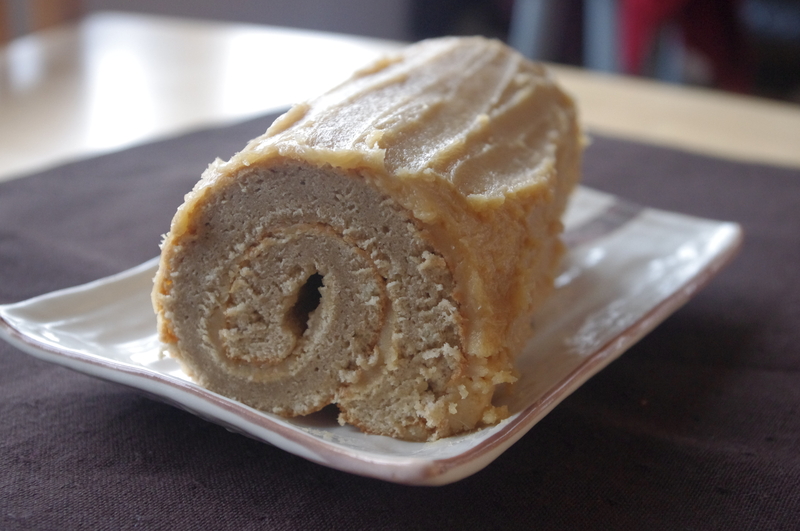 This one is for the mocha roll. Lately, I have been thinking a lot about Tita Babes and missing her. I am also thinking about my babies, still in my womb and this ex-pat life that my husband and I live. Separated by borders, an ocean and a time zone, we live kilometers away from our families. I can’t help but wonder if they will be lucky enough to have a Tita Babes in their lives too. 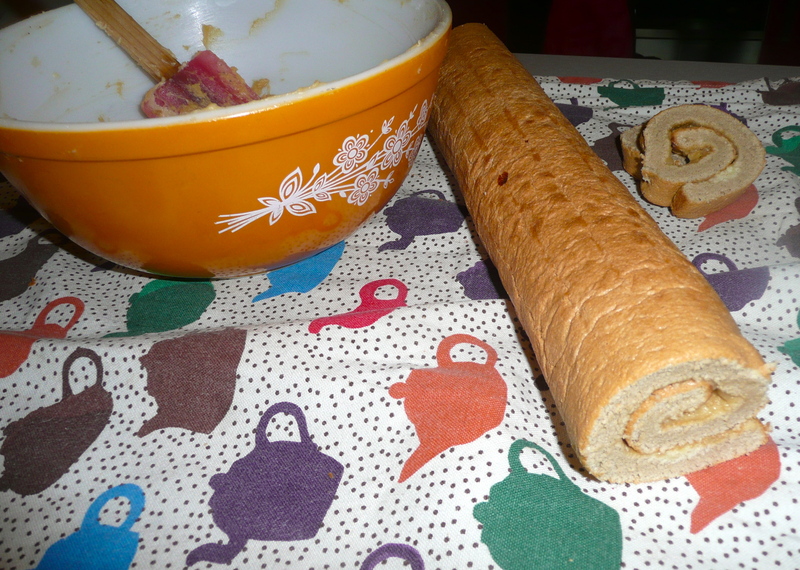 Line a large jelly roll pan with parchment paper or grease it with butter and sprinkle with flour. Dissolve coffee granules with hot water, from the tap is fine. In a bowl, beat egg whites on high for about 3 minutes, until they are stiff. In another large bowl, combine egg yolks and sugar. Beat on high for 3 minutes. Then add flour and stir. Fold in the egg whites and carefully blend all the ingredients. Finally, add the vanilla and dissolved coffee granules. Gently mix all the ingredients together. Then pour into pan and spread the mixture evenly. and then stir into the cream. With an electric mixer, cream the butter. Then add sugar and continue mixing. and cream mixture, tablespoon by tablespoon. 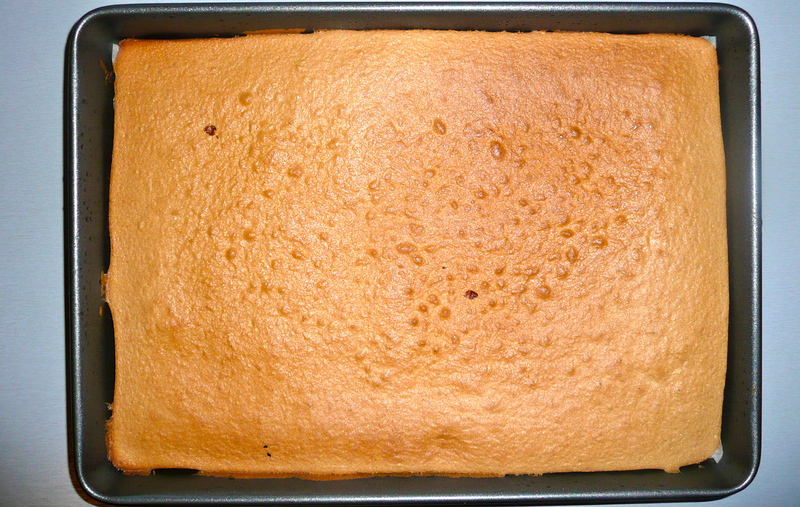 When the cake is done, run a knife along the edges to loosen it up from the pan. Place the towel over the pan. 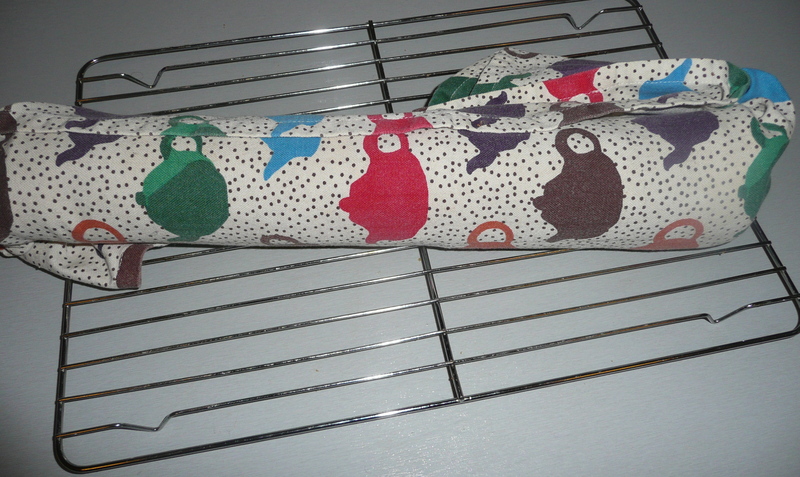 To ensure a good catch, I also place my cooling rack on top of of the towel. Then hold the pan on the short end and flip it over. 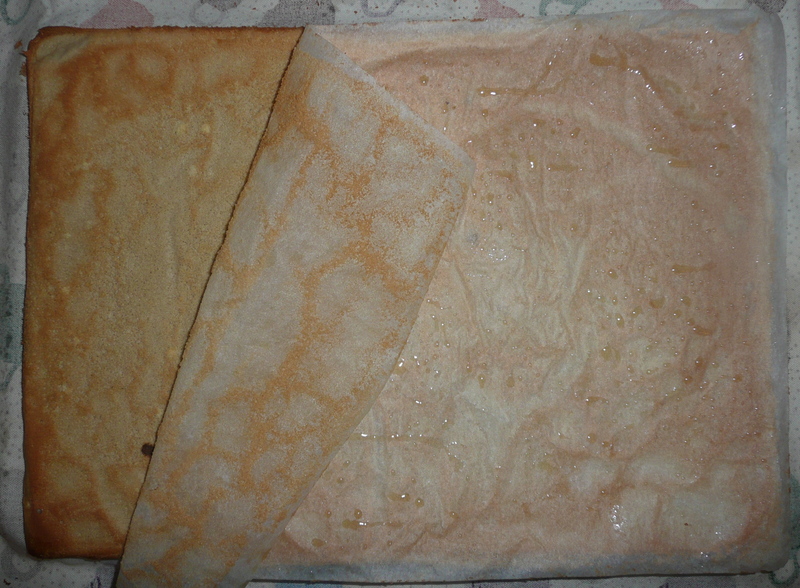 Remove pan and then peel off the parchment paper. 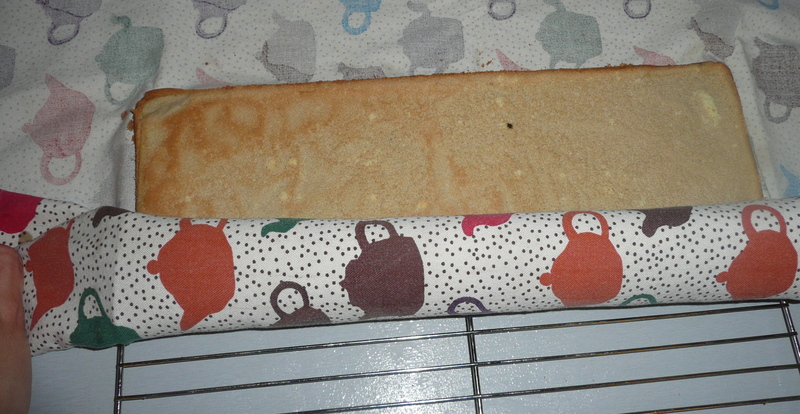 Starting with the long side, begin to roll the cake up. Let the cake sit in this position for at least 20 minutes or until completely cool. When ready, carefully unroll the cake. Don’t worry about cracks, you can cover it up with the frosting. Then spread a thin layer of cream in the middle and sides of the cake. When it is all covered with cream, roll it up again and cut the ends off. 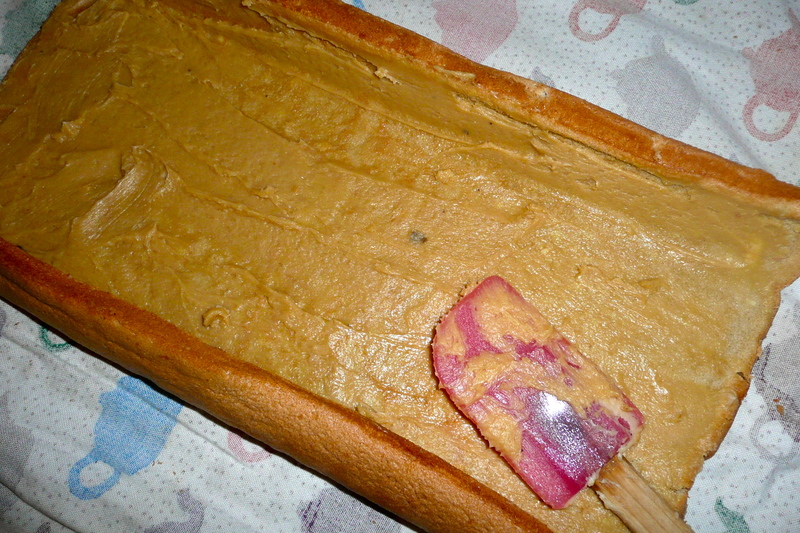 With the seam of the cake facing downwards, use the rest of the frosting to cover the cake. Before serving, refrigerate cake for 30 minutes to let the frosting firm up. You can run a fork along the cake to add some fancy ridges. Leftover slices can be refrigerated or kept in the freezer for up to a month.